Hi everyone! Today I have some tags to share with you all for the Ellen Hutson's 12 Tags of Christmas with a Feminine Twist for 2017. I am so honoured to be apart of this this year! I'm supporting Pretty Pink Posh this year along with my mentor Carissa Wiley, who came up with the theme for snow for these tags, so I create some simple scene tags with using water splotches and also layered sequins to create a snow effect. For my tags today I started out with the Stitched Duo 1 Die Set and cut out six tags from some watercolour cardstock. Then, I used some Distress Oxide Inks and ink blended Cracked Pistachio, Salty Ocean and Faded Jeans onto 3 of my tags. I then splattered them with water and dried it with a heat tool. This was the first way I incorporated snow into my tags. Such a simple effect, but gets the job done. Next, I stamped out my images from the Winter Woodland stamp set and coloured them in with a variety of Copic Markers and used the coordinating dies to cut them out. 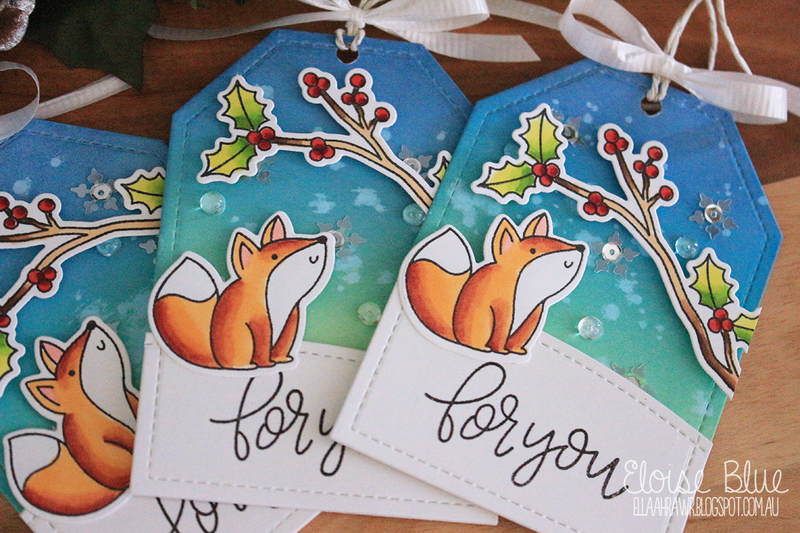 I then used the remaining three tags that I die cut earlier, cut them down using the Stitched Borders 1 Dies and then stamped 'For You' from the Everyday Greetings stamp set on each piece with black ink. 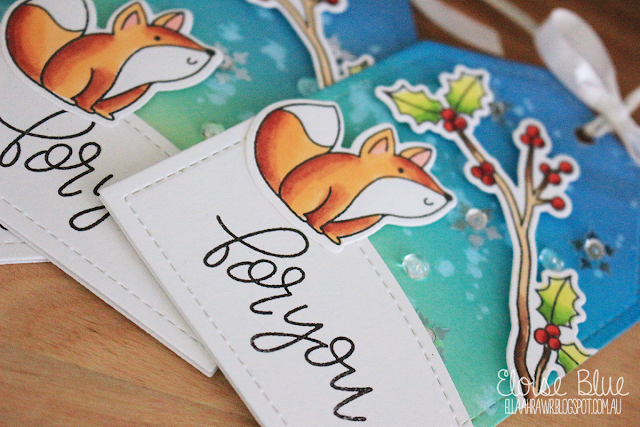 Next, I used some Sparkling Clear Snowflake Sequins and adhered them onto the backgrounds of each of my tags. Then I used some Silver 4mm Sequins from the Starry Night Mix and adhered them into the centres of my snowflakes. Then to finish off my snow look, I adhered some Clear Droplets around the background too. This was the second way I incorporated snow into my background and these clear snowflakes are just perfect for the simple touch! To finish up my tags, I first adhered my sentiment piece with foam tape at the bottom of my tags. Then adhered my holly branch and fox with more foam tape. I punched a hole at the top of each tag and threaded through some Silver Hemp Cord from Lawn Fawn and also tied a bow in some white ribbon. Thanks so much for stopping by today. Make sure you head over to the Ellen Hutson blog to see my mentor Carissa Wiley's tag - she created an amazing one, I absolutely love it! Great job! Love the color combos. 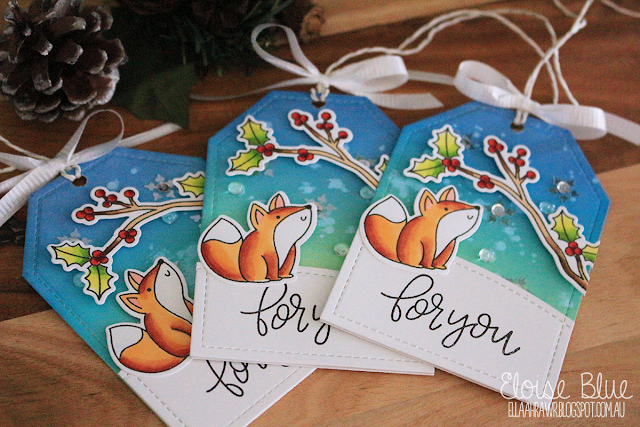 Just wanted to pop in from 'Ellen's' and tell you how much I love your cute and adorable tags...fabulous stamps!! i saw these little cuties on ellen hutson's blog and wanted to let you know just how adorable i think they are!